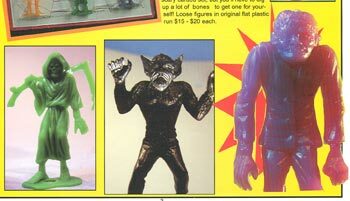 A Dime Store Halloween w/ MPC Monsters, Frankenstein, Horrible Hamilton and more -- in COLOR! Marx Prototype Room at the OFFICIAL MARX MUSEUM: this issue, an unreleased "King" sculpture by Floyd Chamberlain . . .
AND the Complete JOHNNY RINGO WESTERN FRONTIER - Our featured Color Centerspread with over 7,000 words of exclusive history and detail! - From the dusty Western Streets of Republic Studios in 1959, to the Halls of Marx, to a history making Internet Shootout, we bring you the long-awaited complete story of Johnny Ringo! We'll answer the question: Why is this the rarest, most expensive Marx Character Figure? 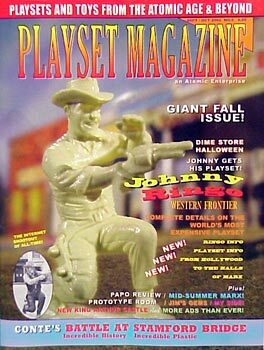 Including exclusive interviews with Don Durant, TV's Johnny Ringo and Frank Rice, Chief Designer of the World's Most Expensive Playset! Plus much more.